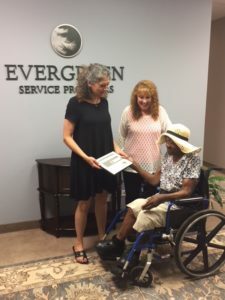 Evergreen Service Providers exists to make the lives of Individuals with Intellectual and Developmental Disabilities (IDD) progressively better. We do so by connecting them with the perfect setting – one that fosters their lasting growth in mind, body, and spirit – and enables them to flourish and make positive contributions to their community. We are passionate about ensuring the dignity of all the Individuals we serve, one person at a time. We could not fulfill this mission without our incredible Host Home Providers. They open their hearts and homes to Individuals who are living with Intellectual and Developmental Disabilities and provide them with stability, dignity and an environment in which they can thrive. In addition to the wonderful support and services our Hosts provide for the IDD Individuals with whom they share their homes, they often go above and beyond anything we’d expect. It’s a demonstration of the compassion and generosity that motivates their actions and illustrates the very deep connections that exist between these Providers and those they serve. 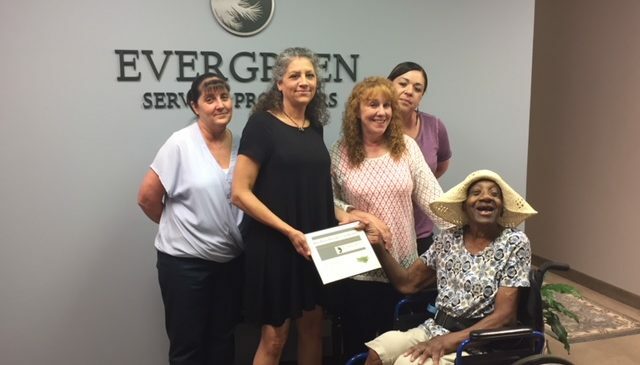 Evergreen Service Providers would like to recognize these very special people with whom we partner to provide opportunities for IDD Individuals. We are delighted to introduce our first “Host Home Provider of the Quarter” – Teresa Sanchez. Teresa had served as a Host Home Provider for Ruth for three years. Recently, Ruth experienced health issues that necessitated Hospice care, but Teresa didn’t miss a beat. She continued to support Ruth by serving as her proxy and even purchased Ruth a hospital bed and specialized chair at a second hand medical equipment store to make her more comfortable. Thankfully, Ruth’s health improved and she was soon released from Hospice care. Teresa is receiving this award because of her willingness to go above and beyond and make other’s lives better. Today, thanks to Teresa’s loving care, Ruth is once again thriving! We honored Teresa with a certificate of appreciation as our Host Home Provider of the Quarter and hope Teresa knows how much she is valued and admired. We suspect her greatest reward is how this experience has enriched not only Ruth’s life, but her own. Thank you for all your hard work and devotion to our mission, Teresa, and congratulations! To learn more about us visit https://evergreenserviceproviders.com/about-us/. Congratulations Teresa. Job well done.